List Rules Vote up the coolest samurai stories everyone should know. For nearly 700 years, the power of the samurai held sway over feudal Japan. These Japanese warriors forged a legend unique among the history of the world. Before the Western world made contact with Japan, the country was segmented into a number of feudal states. Technically there was an Emperor, but for most of the last millennium, the Emperor ruled in name only. It was the daimyo, the individual leaders of each city-state, who really controlled the country. And at the beck and call of the daimyo were the nearly unstoppable samurai, a group of highly disciplined warriors who upheld the tenets of hard work, loyalty, and respect that have formed the foundation of modern Japanese society. First and foremost, though, samurai were fighters. Utilizing a set of tools that made Medieval knights look like total chumps, badass samurai loomed large in Japanese society from the 12th century all the way until the late 1860s. Here are some of history’s crazy samurai tales, featuring the men and women who helped mold the Japan that we know today. At the age of 13 (around the year 1595), Miyamoto Musashi killed his first opponent, a samurai from a neighboring village. Though Musashi was armed only with a wooden practice sword, he killed the other guy inside a minute, throwing him to the ground and hitting the samurai in the throat so hard that he died vomiting blood. Shortly after, Musashi began to travel the country in the hopes of perfecting his technique and becoming Japan’s greatest swordsman. Before the age of 20, he’d distinguished himself by fighting ferociously in several battles and walking out unharmed each time. He’d also begun his tradition of wandering the country and seeking out (then murdering) anyone who was regarded as a master of the sword. He even single-handedly destroyed a famous clan of swordsmen, the Yoshioka family, in a series of duels. The last of those saw Musashi cut through dozens of men after the Yoshioka family sprung a trap. Around this time, Musashi began to wield two blades in combat, a technique completely unheard of at the time. By around 1613, Musashi had made a real named for himself, cutting through some of Japan’s most famous duelists. It was then that he encountered Sasaki Kojiro, a man considered to be Musashi’s most fearsome opponent. Musashi made quick work of Kojiro, but the duel left him upset. It was at this point that Musashi swore off lethal duels forever, because he couldn’t bare to rob the world of any more artists. Musashi’s story goes on like that until 1645, when the old man began to feel his end coming. Rather than sit and wait for it, Musashi moved into a cave and began writing his famous Book of Five Rings, which serves as the definitive text on classical Japanese swordplay. He also managed to crank out a guide to being self-reliant, the "Dokkodo," before dying. In a field that was entirely dominated by men, Tomoe Gozen began her life as a concubine to one of history’s most famous daimyo, Lord Minamoto no Yoshinaka. Adept with both the bow and arrow and the long sword, Tomoe Gozen went into battle at the head of Yoshinaka’s army. In the Battle of Yokotagawara in 1181, Tomoe Gozen reportedly collected the heads of seven mounted warriors. That’s basically the ancient equivalent of Lebron James getting a triple-double and scoring a 100 points in game seven of the NBA Finals. In the Battle of Uchide no Hama in 1184, she went total Thermopylae and led 300 of her troops into battle against an army of 6,000 enemy soldiers. She emerged as one of five survivors. Finally, in a battle before she was ordered to quit the field, Tomoe rode head on into a pack of 30 soldiers, promptly beheading their leader in one swift movement. Badass doesn't even begin to describe it. The ultimate expression of Japanese honor and the national tale of Japan is Chushingura, or the story of the 47 Ronin. It begins in 1701, when two daimyo got into a kerfuffle after they were asked to entertain an envoy to the shogun. Asano Naganori was a young leader from the country who commanded immense respect from his men. Asano was repeatedly insulted for his rural upbringing by another daimyo named Kira Yoshinaka. After being pushed to the limit, Asano lashed out with his tantō (a type of short sword), slashing Kira. Though the wound wasn’t really that bad, Asano committed a huge offense by drawing his weapon in Edo Castle. For his aggression, Asano was ordered to commit seppuku. For 47 of Asano’s 300 samurai, the forced suicide of their master was unforgivable. At first, however, the men made no attempt to get retribution. They quietly let go of their samurai titles, adopting the title of a samurai without a master, or ronin. For over a year, the loyal ronin laid low. Their leader, Oishi, took to hitting bars and brothels and generally engaging in distinctly un-samurai-like behavior. Then, one snowy December night, the 47 ronin assembled and quietly stole into Kira’s castle, murdering him and his entire household. After the murder, the ronin turned themselves in before carrying out the ordered sentence of seppuku. Born in 1490, Tsukahara Bokuden is one of the most prominent figures in samurai history. 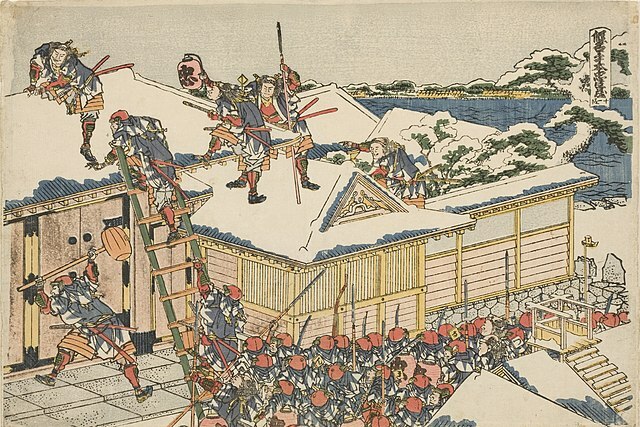 Over the course of 19 duels and 37 battles, Bokuden went completely undefeated, garnering a reputation as the most deadly samurai during the Warring States Period. Then, at the age of 37, Bokuden became convinced that the true challenge was settling disputes without combat. In one famous tale, Bokuden reportedly incurred the wrath of a young samurai while traveling on a boat. When Bokuden attempted to explain the virtue of solving arguments without violence, the young samurai insisted that the boat’s captain pull up to the nearest island so he and Bokuden could duel. When the boat docked and the young samurai jumped out, Bokuden simply grabbed the boat’s reigns and led it out into deeper water, stranding the young samurai and laughing as he left, shouting, "Here is my no sword school!"